Hillary Clinton’s team is getting tired of the Joe Biden talk. And this week, they want to kill it. The Democrat’s strategy heading into a meeting of party elite on Friday is aimed at dismissing the idea now fueling Biden supporters that her campaign is going off the rails, strategists, donors and political allies familiar with Brooklyn’s thinking told POLITICO. 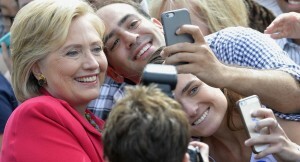 From a sprint through Iowa that deflected attention from the email saga to her first stop in the swing state of Ohio and now the Democratic National Committee cattle call in Minneapolis, Clinton’s operation knows it needs to both flex its political muscles and prove it can keep its nose to the grindstone to score a controversy-free week. The workmanlike stretch is meant to convince Democratic power brokers and big-money donors that they don’t need to place side bets on the vice president — and to suggest to Biden himself that there’s no role for him here; there’s no race to save. The campaign is inviting its top fundraisers to Brooklyn headquarters for a day of strategy sessions with top aides next week, and Clinton’s operation told that group of “Hillblazers” that it would soon start getting regular policy briefings via conference calls with one of Clinton’s closest policy aides, Jake Sullivan. Her team also has made a show of promoting an endorsement from Tom Vilsack — an influential Iowan and a Cabinet member who served alongside both Biden and Clinton. And the biggest pro-Clinton super PAC, Priorities USA Action, unveiled its first ad of the cycle on Thursday.